He has got a striking green neon body and black pupils with golden patches but he is very shy. It’s the bubble nest frog that’s just been rediscovered after 100 years in the Kallakad Tiger Reserve. And in Dehradun the steam frog which wasn’t seen for the last 30 years has now been rediscovered. The hunt is on to discover the lost amphibians of India. To find 50 species that have eluded scientists since they were first discovered a century ago. And the man leading this expedition is frog man Dr. Biju Das a professor at Delhi University. He is credited in fact with discovery an entirely new species in 2003 the purple frog. 30 percent of amphibians in India are facing extinction. The elegant torrent frog recently rediscovered by Dr Biju and his team is in fact losing its habitat to a hydroelectric dam. These frogs which once lived in wild habitats can now be seen only in sterile spirit jars. Species such as these are crying out should I say croaking for our attention. 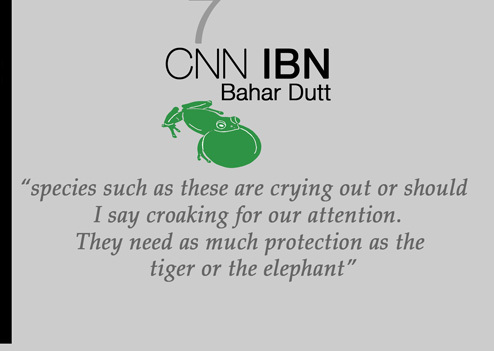 They need as much protection as the tiger or the elephant.